together with my outdoor set-up. This is my first outdoor work of 2016. Had been busy with some work and today, being the eve of the City Day, I decided to visit the Artists Colony in Jalan Conlay. 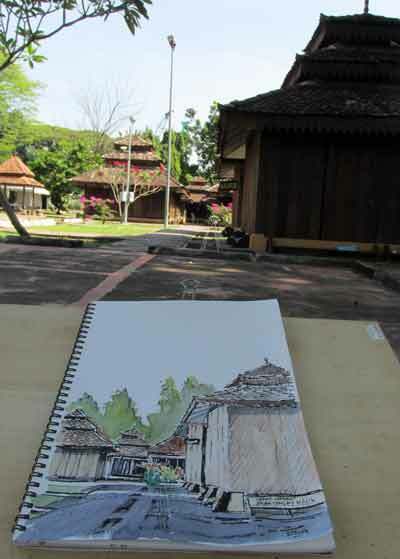 This originally started with a colony of traditional wooden huts for artists to work in but over the years, the number of huts dwindled. A car park came up in the middle instead. 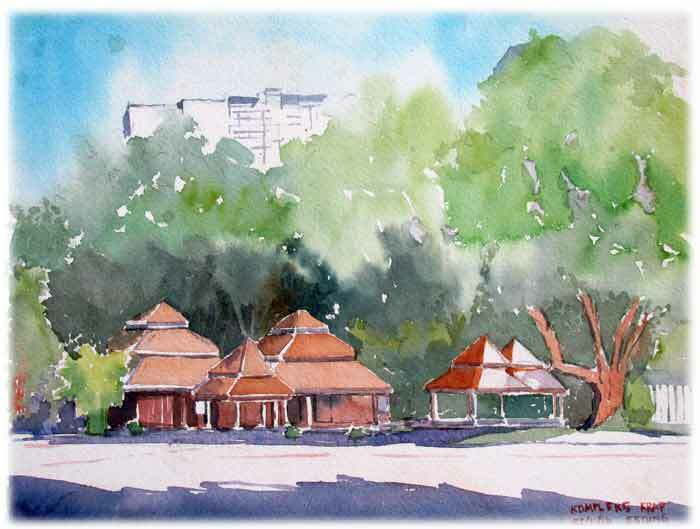 You could still artists at work here, on weekdays, 9am to 5pm daily. The several huts which captured by attention. This is the west end of the colony. Lots of greenery but as you can see, the colony is hemmed in by development. This is prime land, and I hope the powers-that-be will reserve it for artists to work at. 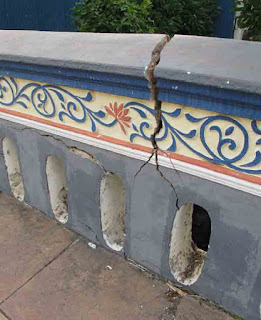 It's the only artistic attraction left in KL. a variety of Chinese dishes, particularly game meats. 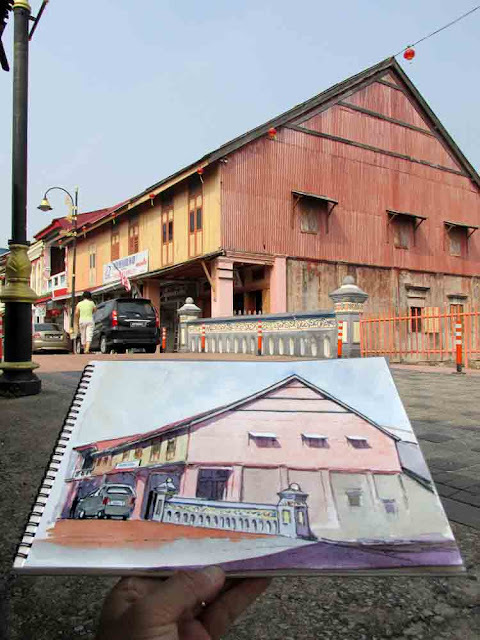 MACHAP BARU is a traditional village of about 1,000 homes located in the district of Alor Gajah in Malacca. 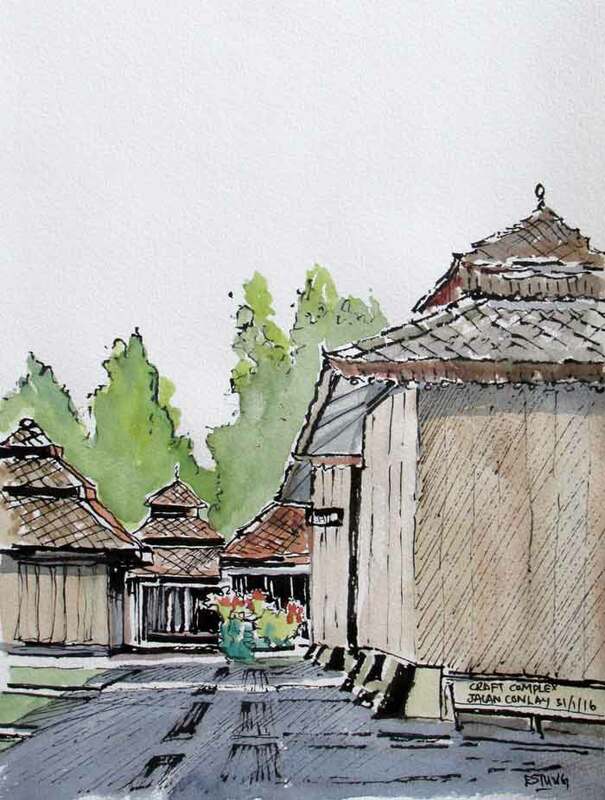 Populated mostly by the Chinese of Hakka descent, Machap Baru is located on high ground overlooking the upper reaches of the famous Durian Tunggal dam which dried up in 1991. 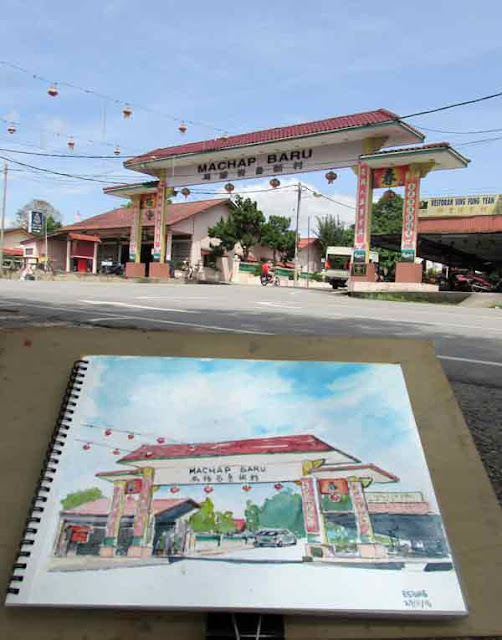 I painted this archway across the Machap Baru-Ayer Pasir state road that passes by the village. 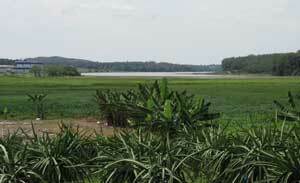 This archway marks the entrance to the village and from here you could see part of the Durian Tunggal dam. According to villagers here, no farming or animal husbandry activities are allowed near to the dam for fear of polluting the water. Machap Baru is well known for its many home-operated restaurants that serve wild game dishes. For this reason, I was told, the Wildlife Department keeps a close eye on these home-run enterprises. Lately, tourists are arriving in droves three days each week, from Fridays to Sundays, to visit Machap Walk, a night market which features a wide range of gastronomic delights. Apart from Machap Walk, there is also a beautiful temple located at the hilltop of Machap Baru, which is said to be very popular during Chinese New Year when devotees come to pay homage to a deity. the biggest dam in the state. Opposite the Machap Baru archway is a stall that sells local agricultural produce like young coconuts, pumpkins and pineapples sourced from around the area. If you happen to be here, ask the stall owner for the red dragon fruits which are planted at his small plot of land just behind the stall. These sweet juicy fruits are affordably priced at RM6 a kilo for large ones.